"Definition of Calibration - To fine tune to a known standard." Hey all, I thought I would port over some of my observations and rants on the new Epson 5040 that I have been posting over on my facebook page. You can get a daily dose of calibration stuff over there as I rant and remark about the little things in my corner of the calibration world. Playing with the new Epson 5040UB tonight in my HT. It arrived Fed Ex this morning. Thing is, this is not my projector, but rather that of a client that lives in Interior BC. I knew him when he lived in Calgary … then he moved out there. And since it will be possibly a year before I make it out his way, he had the new projector shipped directly to me coming from the US. He got it from AVS. And now after 15 minutes of play before I headed to bed, I have to inform him that the projector is defective. Problem with one or more of the LCD chips resulting in a band of purple discoloration on the bottom left edge of the screen. Likely green panel since the image is purple. I will still calibrate it out for him as a learning exercise on the new units. A silver lining for the customer with the Epson … the warranty is for Canada and the USA so he does not have to return the unit to the seller. Turns out there is a repair depot in town … versus him being out of town. Here are some notes so far about the new 5040/6040 projector. It also has the zoned panel alignment feature that works like digital keystone. A new feature has shown up called color uniformity adjustment. It puts up 9 boxes on the screen and you can separately adjust the RGB in each box to even out uniformity in the LCD panel. 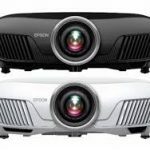 A number of calibrators often joked about the Panasonic LCD projectors having awful uniformity because Epson gave them all the bad chips. Well this Epson has pretty crappy uniformity out of the box too and that surprises me. Worst I have ever seen on an Epson projector in a while. The uniformity thing should help but 9 zones can only go so far. The 3LCD chips here are not the LCD reflective type they used on the laser projectors. The HDR section has 4 settings. I wasn’t able to play with it previously when I worked on a 6040 in a store. The setting choices in this area are: Auto … SDR … HDR 1 … to … HDR 4. HDR 1 gives the brightest image … and the other HDR settings dim the light output almost like clamping the iris. Made me scratch the head why anyone might use the other settings. Maybe if you think HDR effect is too bright. Unit only has one HDMI 2.0a input out of the 2 provided. At least that is how it is labeled. Three power settings on the bulb … High medium and eco. Comes preset to medium. Feeding the USB based HDR clips from the Samsung UHD player do not trigger the HDR mode in the projector. The info page still says Rec 709 8 bit color. Playing these same clips on the LG HDR sets triggers the HDR on message. Only playing a HDR UHD disc did the info change to 12 bit rec 2020 and the 4 HDR choices open up. Just playing with this unit for the short time so far, it is very apparent the quality differences between this and my Epson Laser projector. The Client is getting a replacement for this Epson from AVS so I’d better get some hours of play time on it before boxing it back up. He he. Remember … multi-zone grayscale to fix uniformity will be an added expense. 🙂 it’s like doing 8 more grayscales on the same projector. And then I play with the controls on the projector and this difference is often met with just one click of a control on the dial. Close enough to not really worry about anymore. At least I know. The material is really close enough. Packed up that defective Epson 5040 … now awaiting the replacement from AVS. Then shipping this one back to them. This projector definitely treats some of those USB based HDR/4k SDR clips differently compared to how the LG, Samsung and Sony sets … heck even my Epson Laser. Different in a bad way … as I was playing with this LG clip with which is super colorful and about this group of trick basketball artists. The projector had just been calibrated to P3-DCI within the 2020 bucket … and every one in the clip looked positively garish. Was the altered CMS to blame here? I slowly reset the CMS to default values and it still looked awful. I looked at that image of the Girl next to the chip chart from the RM HDR pattern set … too red. Then I looked at this motion clip from the DVE UHD test pattern suite and also too red. Base Digital cinema color filter is DCI … not DCI within 2020. As a result, you will have to pull that triangle over to where the P3 DCI is. All this playing didn’t actually chew up 1 hour on that projector. Spent part of the evening playing with the replacement Epson 5040 projector that arrived today. Setting up at least five modes for the client. 709 HD … 3D … DCI … 2020 P3 … and a 2020 p3 mod where the 2020 setting might not look right. I haven’t finished all the modes yet but at least this projector doesn’t have that chip defect like the last. The projector perfectly hits the DCI gamut but has more trouble doing the p3 within the 2020 container. It gets closer. Funny thing is I can send the 10 bit color patterns into the projector and they seemingly get close to the p3 gamut … but then when I force the projector into its 2020 mode rather than leaving it on auto … the color triangle points changed again. Finished up by watching some UHD flicks … PAcific rim and the martian. The HDR select area will default to different HDR settings depending on the film you put in. Pacific rim made the projector select HDR2 setting. Way too dark. I forced it to HDR 1. That was something else that really bugged me with this projector so far. By selecting the digital cinema option … the additional color filters slide into place to allow the projector to do the wide color. But there is a price … wow does that filter knock down the available lumens of the image. It does so on my Epson laser as well but it is not this noticeable. I still have to do 3D tomorrow night … and then I will do the 2020 stuff again but at the medium bulb setting instead of the high setting this evening. Did the 3D first … which requires a 3D test signal going in as the projector won’t convert 2D to 3D like previous TVs and projectors. JVC used to convert to 3D but they dropped that feature. Luckily the Video Forge can output 3D. Pretty straightforward calibration here as the glasses added a red tinge to the image that had to be dialed out. The biggest hassle in doing this is setting up my CS 200 in tandem with the Klein to do profiling. Sometimes Calman doesn’t like these two meters plugged in at the same time so I have to purposely search for the CS200 first … making sure to uncheck the klein box in the meter list. Once it finds the CS, then I uncheck the CS and tell it to look for the klein. Took quite a few permutations to figure that out for my laptop. I should note that through this whole process, I don’t always start with the same master color temp preset value. I pick the one that is closest to d65 … but that changes from picture mode to picture mode. The final two calibrations were for the 2020 p3 mode but at the medium lamp setting. I made sure to force the color space to 2020. Interestingly enough this time, I did not have to change the calibrated 2020 p3 settings after the run as the UHD material especially people looked about right. Now a comment about how this projector interacts with the UHD hdr material I have on the USB stick. On the LG HDR flat panels, they don’t care if the UHD signal is coming off the HDMI or the USB port. They see it … and the “HDR On” message shows up for a brief moment at the top right of the screen. My earlier experience with the first Epson 5040 raised some questions about how that project handles the signals because some stuff did not look right at all. So here’s the scoop on this difference. The Epson doesn’t see the flags correctly in the USB data to flip on HDR or select 2020 color. I have to manually set it to HDR1 and pop the color space to 2020. This cannot be saved in the 10 memory slots of the projector either. You will have to remember to do it manually. I also tracked down why some of the UHD clips looked funny and the reason is that they were non-HDR clips. Turn off the HDR (ie set it to auto) and the colors and image fix themselves. So it can tell the difference between the clips, but you have to manually change it yourself. On the LG sets, you just play them and the TV figures it out. The reason for the manually switching of the HDR settings is that if set to Auto, there is something in the HDR signal be it the disc or the player that tells the projector to choose the HDR2 setting. The info page on the Epson actually tells you that the signal is saying HDR2 should be used. If you leave the HDR setting to auto detect, that is what you will get, HDR2. The trouble is, the HDR2 setting does not look very good at all. The HDR3 setting is even worse … and HDR4 is positively awful. Worst of the worst. Again I can’t see why anyone in their right mind would choose anything other than HDR1. The HDR3/4 settings take the image into the unwatchable area. Image is so dim and lifeless. Additional note here … the HDR settings page has 6 settings … Auto … SDR … HDR 1-4. If you play HDR material and flip the setting to SDR … you flatten out the image. But, but, but don’t be fooled into thinking that this is what the SDR image really looks like. Just have to pop in the blu ray version of the same film to see that the image there is actually closer to the HDR image than the SDR facsimile. I finished the evening by playing with the panel color uniformity adjustment to tweak out some of the more visible uniformity issues. This 5040 had much better uniformity than the previous one. Although 8 boxes of adjustment are better than 0 boxes … there is no adjustment of the centre box since you would have done that with the color temp adjustment. What I mean is that a number of the boxes themselves will have their own uniformity issue as in one side of the box is gray and the other side is reddish. Conceptually doing this is very similar to working on video walls and I have a training video for that. May 15, 2017 update – The color uniformity feature should not be approached with a color meter and software. Unless one is using a spectro like the CS200 or Photo research meters that are self contained, aiming any other meter is going to be very hard indeed. It also does not help that individual boxes may have their own uniformity issues. So the best way to approach this it to do it by eyeball. Considering that you are dealing with 10 pages of boxes and 8 adjusted boxes per page; that is 80 little calibrations beyond the main one that you are doing. So what does doing it by eye mean? It means to take a box … let’s say 50% Right Centre … and adjust it until it looks like the 50% centre box. What you are doing is matching the left side of this right centre box to the right side of the centre box. The goal is a smooth transition from the centre out to the right centre box. When you are happy with this box, you apply the same method to the other 79 boxes. Understand that the darker the gray box is, the easier it will be to see the differences between the boxes. 73 New Display Calibration Training Videos! 18 are Free!! "...The video series Michael and Ray collaborated on is worth far beyond what is being charged for it. It's practically a "steal" by any fair measure." - Alan Brown, CinemaQuest, Inc. The most comprehensive calibration training out there for those that just want to do it right. One day and Two day training available. Test Your Calibrator – Quiz! Is your calibrator any good? How could you check? Or do you just want to challenge your calibration knowledge? A quick way to verify if you or the calibrator knows his stuff ... Click here. The most current exam answered in detail. Understand what the correct answers are and why the other ones are wrong ... Click here. If you are new to the world of calibration, go here first to find the site guide tailored just for you. “Calibration From The Inside #1 – Revised 2nd Edition” … A must read for those new to the calibration world. Whether you want to hire someone to do this or a Do It Yourselfer or just looking for great information on what TV to buy … a great resource to have on hand.